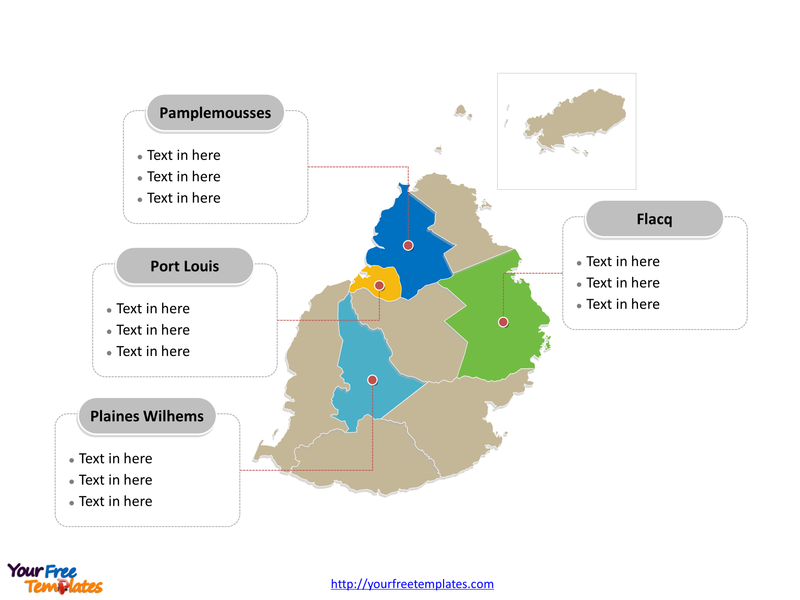 Our Mauritius Map Template in PowerPoint format includes two slides, that is, the Mauritius outline map and Mauritius political map. 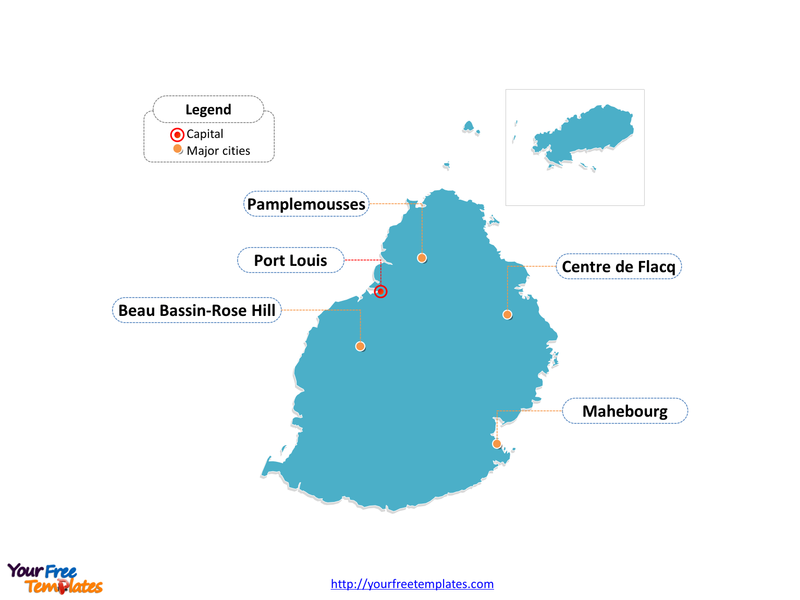 Firstly, our Mauritius outline map template has capital and major cities on it, which are Port Louis, Beau Bassin-Rose Hill, Pamplemousses, Centre de Flacq, and Mahebourg. Secondly, there are nine districts in our Mauritius political map template of divisions, labeling the most populated divisions that are Plaines Wilhems, Flacq, Pamplemousses, and Port Louis. Slide 1, Mauritius map labeled with capital and major cities. Our Mauritius map is for the island nation in the Indian Ocean about 2,000 kilometres (1,200 mi) off the southeast coast of the African continent. The fact that, Mauritian investors are closely linking to African markets, notably Madagascar, Mozambique, Zimbabwe and South Africa. As Port Louis is the capital and largest city of Mauritius, furthermore, other major cities including Beau Bassin-Rose Hill, Pamplemousses, Centre de Flacq, and Mahebourg. Owing to our Mauritius map slide has the capital and major cities on the outline. Accordingly users can remove cities or include new ones to create their unique Mauritius maps and apply in different docks. Slide 2, Mauritius map labeled with major districts. The Mauritius map is the country political division of nine districts. With regards to the nine districts, they are Flacq, Grand Port, Moka, Pamplemousses, Plaines Wilhems, Port Louis, Rivière du Rempart, Rivière Noire, and Savanne. 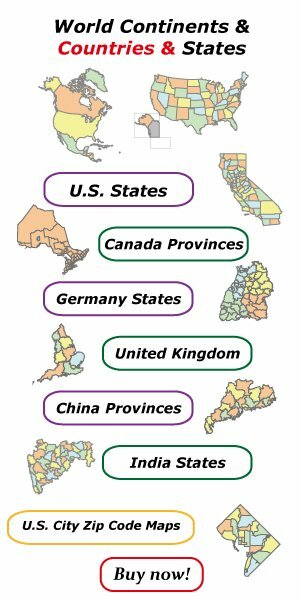 In addition, every individual political subdivision is an editable shape. Therefore you can change the texts, colors, sizes, highlight some map shapes, and add your icons or diagrams. At the same time you can also refer to the fully labeled Mauritius map in Wikipedia. As a final point, analysts from marketing research companies, consultants from professional firms have appreciated our efforts greatly; because our maps can assist them achieving effective communication.